Portland has been accustomed to auto-parking/bike-lane tradeoffs for years. 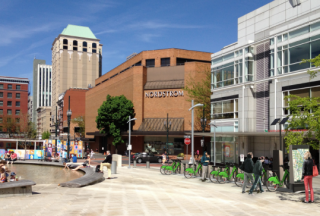 Now it’s about to encounter a new tradeoff: auto-parking/bike-share-station. 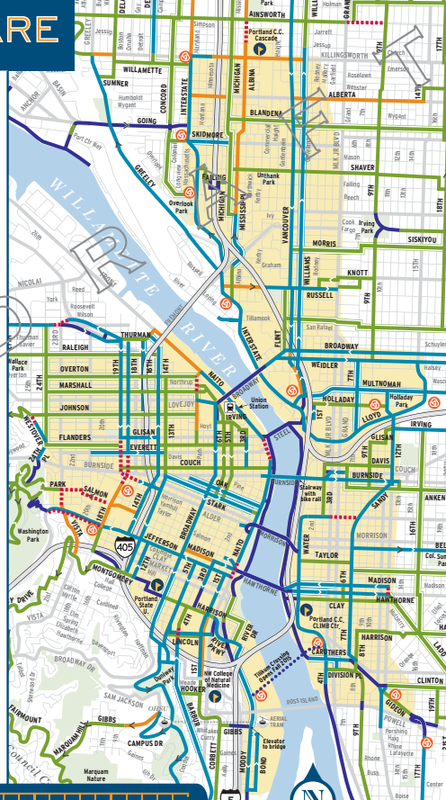 A round of five city open houses this spring will start the public conversation about where to put the stations for the bike sharing system Portland plans to launch by July. And though some locations are probably no-brainers (Director Park, Pioneer Courthouse Square, Urban Center Plaza, Jamison Square, Union Station, Holladay Park, Rose Quarter Transit Center, Little Big Burger on Mississippi…) others will be harder. As we mentioned in yesterday’s post about Seattle’s bike share struggles, the ideal distance between bike share stations seems to be no more than five blocks, the more evenly spaced the better. Portland won’t be able to meet that standard in much of its area, but it’s a star to aim for where possible. The city’s most recent map of a possible bike share service area, from before Nike’s sponsorship. The city says the service area is likely to expand at least a bit but it hasn’t yet offered details. Fortunately, Portland has a lot of firsthand experience with the benefits of bike parking. Nearly every single one of the city’s 130+ bike parking corrals has been installed with support from neighboring retailers, and they’re so efficient (in terms of “customer wallets per square foot of parking space”) that some businesses even pay to jump to the front of the city’s queue. Successful bike-share stations seem to have a similar effect; a 2013 survey of people in Washington D.C. business districts found that 66 percent of Capital Bikeshare users are on their way to spend money somewhere, overwhelmingly at businesses within a few blocks of a station. Putting bike-share stations near mass transit stations is important, too — probably for the sake of both bike sharing and transit. 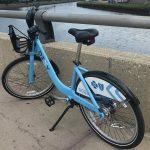 A 2014 study found that the two modes are complementary, and that a 10 percent increase in Capital Bikeshare ridership tends to happen alongside a 2.8 percent increase in Metro rail ridership. 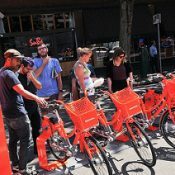 Biketown’s “smart bike” system adds an interesting twist to all this: in a sense, when we talk about “stations” on Portland’s bike sharing system, we’re basically just talking about invisible columns of air around which the system has drawn a digital “geofence.” Park your Biketown ride anywhere inside the column (which will probably be about the size of a city block face) and a satellite will detect that you’re in the “station,” even if you’re not locked to one of the system’s specially branded racks. 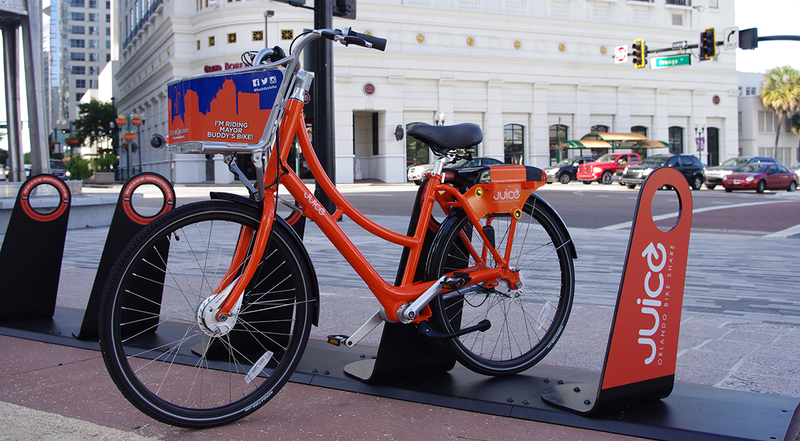 The simple metal racks of Orlando’s Juice smart-bike sharing system will resemble Biketown’s. That could be a useful tool. One of the unique strengths of Biketown will be that its bikes will be able to spill into nearby bike staples and corrals as needed; no station will ever be completely full. And the chance to put a station where it “should” be with zero political pushback might be good. The only reason Biketown will have physical stations at all is to make the system visible, memorable and special. But here’s the potential downside of “smart bike” systems: Biketown is going to need to feel like a thing. The only reason Biketown will have physical stations at all is to make the system visible, memorable and special. When I’m Biketowning to the coffee shop, I don’t want to have to pull out my phone and open an app to figure out whether I can park on a certain block. I just want to see a station and lock up. So for Biketown to serve the riders (and deliver the customers) that we all want it to, it’s going to need stations with a physical presence. In addition to the auto parking/bike share station tradeoff, I’m concerned about preserving enough sidewalk space for walking and wheelchair users. While ADA should require enough sidewalk space for wheelchair users, how much space is recommended for comfortable walking space on a crowded sidewalk? How will Portland proceed if it has to decide between reducing sidewalk space or removing an auto parking space? Auto parking provides Portland with revenue. Sidewalk space is free to walk on so I’m going to assume that sidewalk space is going to be reduced for a bike share station before auto parking is removed for a bike share station. In most places, auto parking generates no income. And, besides drive-throughs, most businessea require that a customer use the sidewalk to enter. Reducing the sidewalk width would hurt business. Removing a few parking spots won’t. I’m referring to only downtown Portland, which will have the majority of bike share stations. Portland or private companies receive auto parking revenue from most downtown Portland auto parking. Unless Portland business culture is different than my perception, I disagree with your last sentence. Many Portland businesses value on-street parking so likely would rather keep on-street parking and reduce sidewalk space for walking. I would love for Portland businesses to prove me wrong. Since bike corrals are popular, maybe it will be easy to remove on-street parking for bike share stations. >Since bike corrals are popular, maybe it will be easy to remove on-street parking for bike share stations. Walking around downtown I see far more bikes locked up on the sidewalk than in street sited bike corrals. Is there a finalized map of the service area? I’m guessing the most recent one is out of date since the system will be launching with twice as many bikes as previously thought. Yes, the service area will probably be bigger thanks to the sponsorship, but we don’t have a map yet. I expect that’ll come March 9, too. Great, looking forward to it! Thanks! Nice list of suggested locations, Michael. The plaza in front of Little Big Burger on Mississippi appears to be private property. I wonder if the City is considering placing stations on publicly accessible, privately owned land such as that, or if they’re only considering publicly owned right of way and parks. That plaza on Mississippi is a great location, but the biketown station should be on the street! That plaza is already very crowded and it would be unfortunate to clog it up with a bunch of bikes. I’d recommend putting the bike stations outside bike shops. Drop your bike off for repair, pick up a bike. We would not want bike shops to have cars out front any way – it looks bad for business. Another good location would be in parking garages – REI parking garage, some at any parking garages for government offices (since they want it, they can sacrifice some parking spaces), etc. Parking garage locations will keep the bikes dry. 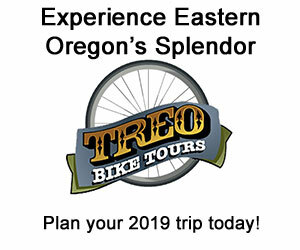 Does trimet have any on-street or parking garage parking that could be used for bikes? PBOT? PCC parking garages? Etc, etc. tl:dr – the 100 Biketown stations should be placed densely in the 5 square mile initial area, not expanded outward. The 2 square mile area of inner NW and SW (downtown) Portland had 46 stations. The core of downtown had about 6 extra stations, and the other 40 were pretty evenly spaced in a grid-like pattern over those 2 square miles, about 5 short blocks apart (1/4 mile or 1300 feet). The central core, inside Burnside, 405 and Naito, had 22 stations planned in 0.6 square miles of area, which made stations about 3 blocks apart. In that area no one would have to walk farther than about 3 minutes to the nearest bike station. In inner NW and Goose Hollow, the max walk distance would be 5 minutes to a station, and the average walk only 2.5 minutes. But despite the map legend claiming that the phase one stations would be about “1000 feet apart”, the 2.7 square miles of coverage area east of the Willamette had only 27 stations, only 10 per square mile. That’s half that was planned for NW Portland. Most of the stations are 1800 feet apart; 7 blocks, and that means it would take up to 7 blocks and 7 minutes of walking to get to the nearest station from even many parts of the Lloyd district. Some of the stations in North Portland were even further apart, meaning up to a 10 minute walk to a station; that’s over 3 times longer than the distance to stations in the core. The phase 2 area would expand the system east of the river to 10 square miles, according to this map, while only adding 50 station. That drops the station density to 7.5 per square mile: stations would be more than 2000 feet apart on average. Perhaps some areas would really get the promised 1500 foot spacing (6 minute walk) but then other areas would end up with stations a half mile apart or more (>10 minute walk). There are 2.5 square miles in NW and SW, and 3.5 square miles of area east of the river; basically 1 square mile more than the first phase from 2013. If the downtown core gets an extra 10 stations, that leaves 90 stations to spread around, or 15 per square mile. 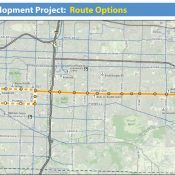 Perhaps the west side will get about 60 stations (20 per square mile, outside of the downtown core), and the east side will get 40 stations at just over 10 per square mile. This would work well; the Lloyd district and the area along the Streetcar line can even get a few closely-spaced stations. But I hope the city doesn’t push the bike share system to expand beyond this area. 1 more square mile could be added, but any more expansion that would lead to stations too far apart. If SE and NE Portland want stations east of 12th, the city needs to put in extra funding. 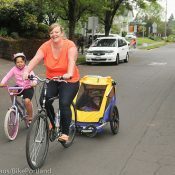 There are 3 square miles needed to get to Cesar Chavez (39th) between Broadway and Division, and another square mile in North and NE Portland should be added at the same time, if the city get funding for 40 stations and 400 more bikes. It wouldn’t be a good idea to spread out the first 100 stations over 10 square miles, but 140 stations would do the trick. Thanks, Joseph. Good idea — I added the map to the post. All I can say is Bloomberg did it too. Fixed. Locating them at intervals along the Springwater trail would make sense. Wells Fargo Bank on Milwaukie Av. would make sense as a station location, not too far from the Bybee Orange LIne station. One at OMSI and one next to the Starbucks on the west end of Tillicum Crossing. PSU Urban Plaza, no brainer. Should be good sized stations at Lloyd Ctr., Rose Qtr., Amtrak Union Sfation. Some along the I-205 trail, too, especially Clackamas Town Center and Gareway. PDX airport should be on the list at some point. In front of Hopworks, Breakside, Velo Cult, Gigantic, Ecliptic, etc to make bar hopping easier. Nike should put one on the Adidas campus in NoPo. im going to go out on a limb and suggest that bike sharing is a fad transit mode especially in dense and easily walkable downtown portland. im not poo pooing the idea of tourists riding bicycles but let the hotels they stay at provide such a service, that seems more logical and the maintenance logistics would be easier to handle, not everybody needs to ride a bike. I like the idea of having them near or at hotels. People on business trips can’t haul their bike with them in most cases, and they would appreciate convenient bike rental for exercise after work etc. PBOT is looking for on-street areas that already have parking removed, particularly near intersections, for bike stations. Other potential locations: the rumored ‘town centers’; transit centers and stations; food pod locations; OMSI. It also seems to me that the most beneficial system will include stations in dense residential areas so you could walk a short distance from home to ride to a station or town center. Once at a ‘destination’ you don’t need transportation, and ‘destination’ to ‘destination’ sounds more like a tourist activity. 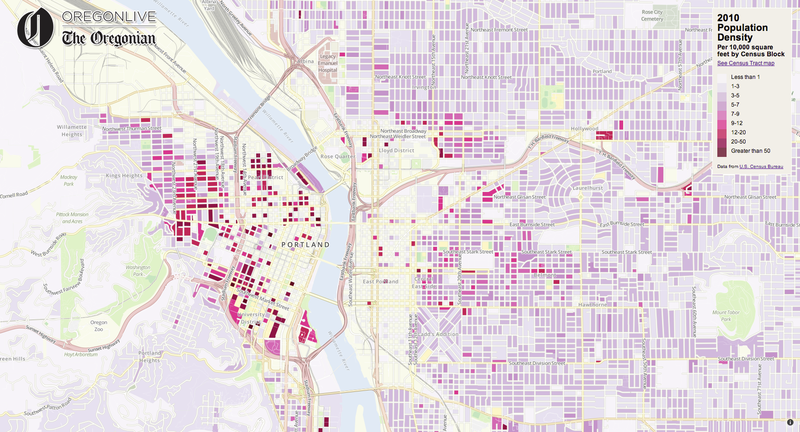 Portland has dense residential areas? Maybe NW and Goose Hollow, but most of our neighborhoods are quaint streetcar suburbs with barely the density to support a nearby grocery store. I’m not sure how well they’d support a dense grid of bike share stations. 100% correct. It seems like PBOT is desperate to expand out coverage as wide as possible into traditional “bike-friendly” neighborhoods. These are the same neighborhoods with wide swaths of single-family residential zoning. 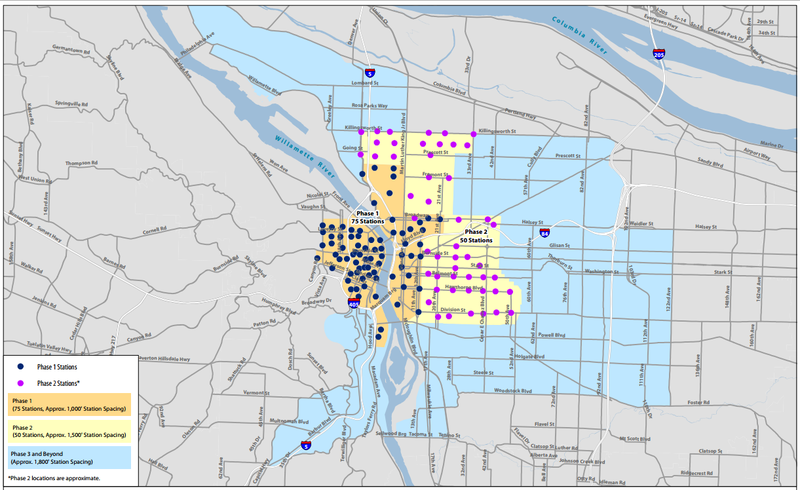 If PBOT was serious about making the system a success, it would keep the initial rollout confined to those same “dense residential areas” where multifamily housing is prevalent: namely NW, Pearl District, South Waterfront, Goose Hollow – pretty much just the Central City. How about where greenways cross transit corridors? Is there a reduced fee for overnight? Might work as the last 10 block solution for underserved areas of the city. The fleet should have plenty of cargo bikes, especially at PDX airport and Amtrak Union Staion. Great for hauling luggage. Ditto for the major hotel and motel sites. At all MAX stations. Only problem is that you might want to pick up a bike where you get off MAX, ride it a few miles to work, park it all day, then ride it back. So, it would only serve one person per day for the most part.